Ill-fitting clothing can make you look like a fool, an indignity suffered by clowns with less-than-giant feet everywhere. Striving for the perfect fit, 5th and Lamar. Started by a pair of young Austin professionals (yappies? 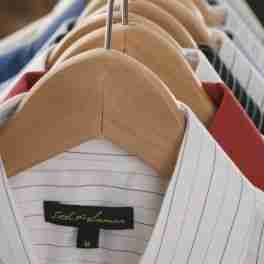 ), 5&L is a homegrown line of "super slim" dress shirts made with an absolute minimum of excess fabric to combat "the muffin-top effect" -- the bulge above the waist, not the phenomenon where even the homeless waste 90% of their breakfast. 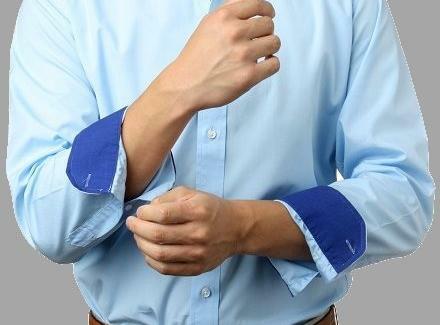 Each high-quality cotton number is narrow-sleeved and broad shouldered (to give you a streamlined and triangularly masculine appearance), and named after iconic Austin streets or landmarks, with more formal tuck-ins like the basic Ben White, the solid-pink, gray-interior'd Windsor, and the white/black striped, black contrast-cuff Guadalupes, whose "Gruene" version comes with a second shirt just for floating your light beer! They also offer more casual "untuckers", like the Sheridan (purple with thick black stripes, black lining), and the red, black-striped-and-cuffed Red River, host of the fiercest rivalry in the Southwest, Mohawk vs. Mo' condos. Since the company gets that not everyone will find their perfect fit perfect, they give you two weeks to return your purchase, refunding your money plus shipping -- so despite going back to boxy clothes, with your cash back in hand no one will pity the fool.